Arthritis in dogs is an inflammation of your pet’s joints. It is usually caused by the general wear and tear of a dog’s joints as they grow older. But it can have other causes, especially in younger dogs. Some common symptoms of arthritis in dogs include: limping, swollen joints, and difficulty moving. We will take a look at glucosamine for dogs, and whether it’s an option you should be considering. 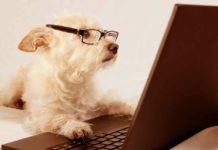 Along with giving you some great care tips, we cover everything you need to know to keep an arthritic dog comfortable at home. Arthritis is simply a term to describe inflammation of the joints. It can occur in any of the joints in your dog’s body, and is fairly common, especially in older pets. The hip joint takes quite a pounding in both dogs and people. It’s one of the body’s major muscles for movement. Arthritis occurs when the smooth cartilage within a joint becomes rougher, causing the bones to rub together. As joints age, they are subject to a certain amount of wear and tear. This wear and tear in the joint is the most common cause of the pain and inflammation that we call arthritis. It can however be caused by other things in younger dogs, such as trauma from injury or problems with your dog’s immune system. Whilst a certain amount of wear and tear always takes place, severe arthritis is not inevitable. The good news is there are steps you can take to help prevent arthritis in dogs. Whilst old age is inevitable, there are some ways that you can prevent or delay the onset of arthritis in dogs. One of these ways is through weight control. Simply put, the more weight on a dog’s joints, the more difficult and stressful his arthritis is likely to be. Body weight is a massive factor in arthritis. Slim Labradors are less likely to get arthritis than fat ones. This is something you can actively help with. Obesity in Labradors is a growing problem. And it’s one that we as owners have complete control over. It may be difficult, but ignoring those begging, puppy dog eyes from time to time might be a good idea. By not giving in to their adorable stares, you could be seriously improving your Lab’s quality of life. 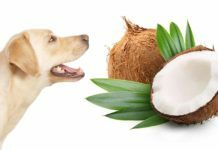 Your dog may well be hungry, but that does not necessarily mean he needs to eat. Try and distract him with some activity. Also, try to ignore the fact that he is following you around with his dinner bowl in his mouth. He’ll thank you for it later when he is still zipping about at fourteen years old, instead of crying in pain when he gets up in the morning. If you are worried about your Labrador’s weight, then check out this article, which is packed full of helpful tips and advice for doggy weight loss. 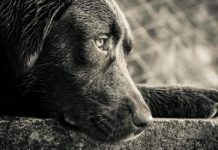 Labradors are one of the breeds who are unfortunately quite likely to suffer from hip dysplasia. You can reduce the chances of your puppy suffering from this disease by only buying a dog from parents with low hip scores. This does not entirely remove the risk however. Conditions like hip dysplasia, where there is an existing deformity of the hip joint, puts the dog at increased risk of arthritis. It is therefore even more important that you care for him to help reduce the chance of it developing. One way to do this is by keeping his weight down and making sure he gets the right amount of exercise. If your Labrador has hip dysplasia do consult your vet on the best way of caring for his hips, before he gets old and creaky. Another way to help your dog’s joints stay healthy is to keep his feet in a good condition. Clipping his toenails so that they don’t distort his normal walking and running gait will help to maintain his joint health. As your dog ages, it pays to be aware of the possible symptoms of arthritis. By doing so, you can give him the best possible care. This means taking him to the vet during the early stages, rather than waiting for him to become more uncomfortable. Remember, if you see any of the above in your dog then pay a visit to the vet. Some symptoms shown can be signs of other issues, especially is displayed in younger dogs. It is better safe than sorry. Your vet will be able to let you know whether your dog is suffering from canine arthritis by examining him and taking x-rays. If you suspect your older dog is developing arthritis do have him checked over by the vet. Of course, there are other diseases and injuries that can cause lameness, stiffness and pain. It may be that your dog simply has a minor injury that needs a little rest. 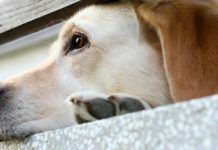 If the veterinarian suspects there may be another cause behind the arthritis, they may also take a sample of joint fluid or carry out blood tests to rule these out as well. 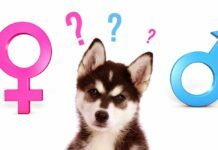 the vet about which course of medication would best suit your dog. NSAIDS are drugs used to treat the inflammation and pain of arthritis in people and animals. But it is really important that you do not give your dog NSAIDS intended for people. Ibuprofen for example is a popular NSAID for treatment of humans and is toxic to dogs! Arthritis medicine for dogs is specially formulated to relieve their pain without causing them further problems. Your vet will be able to prescribe effective painkillers to keep your old friend happy and active for as long as possible. They may also suggest nutraceuticals, such as glucosamine and chondroitin, in the hopes that they will improve cartilage repair. Glucosamine is an amino sugar that was thought to promote the repair of joint cartilage. Some studies in people have produced conflicting results. However, the consensus in the veterinary literature is that glucosamine and chondroitin sulphate together will help reduce pain and swelling. They may also help repair damaged cartilage. You can order dog glucosamine online and buy it in pet shops. (But make sure that you don’t use the human variety). Before you do, it’s important to ask vet whether this would be suitable for your dog. When your dog is in pain or discomfort, it is perfectly natural to want to do everything in your power to help them. The best arthritis medicine for dogs is that which is prescribed by their own veterinarian. They will know what to give them to best reduce their pain and discomfort. Similarly, after some time you may feel as though your dog needs more medicine than what he’s been prescribed. Do not change the dose without consulting your vet. Try to avoid untested remedies found online. These might cause your dog more problems than they will solve. It’s frustrating to see your dog suffering, not least when you can’t further medicate him. Fortunately, there are some things you can do at home to help him get more comfortable. If your dog has been diagnosed with arthritis, then your veterinarian will prescribe you appropriate medication to help them manage the pain. It might be worth consulting with your vet about canine physiotherapy. Doggie physio can be a great way to relieve some of the pain from aching joints and muscles. As well as that, you can do plenty of things to help them live a more comfortable life with you at home. 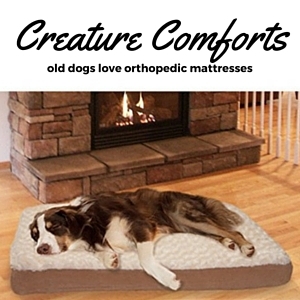 There are some really great orthopedic dog beds for sale. Designed just for larger, older dogs who have joint problems. They usually have memory foam mattresses, and thick bases. To give your dog support and comfort whilst he rests. This therapeutic, deluxe dog bed is a great size for even the biggest Labrador to stretch out and get comfortable on. 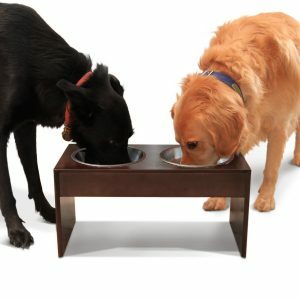 Raised dog bowls can make it easier for a Labrador with joint pain to enjoy his meal or drinks in comfort. They maintain the bowls at a height that can be reached without bending or stretching downwards, which puts pressure on their sore joints. Please remember that raised dog bowls are not however recommended for younger dogs or those who eat their meals very quickly, as they have been linked to cases of Bloat in dogs. You may be unsure whether an elevated dog bowl would be an appropriate choice for your Labrador. If that is the case, then be sure to chat with your vet before you shop for one. 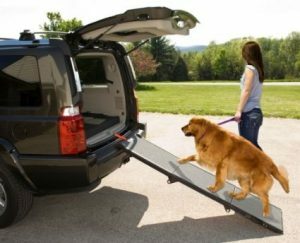 Finally, if you live up a flight of steps or have a high vehicle you need your Labrador to get in and out of, then you might like to consider a dog ramp. Most Labs are not of a size or weight that can be easily hefted around by a human. So, when they are in discomfort using a ramp can be a very effective solution. You don’t have to worry about putting permanent structures around your home, or attaching unsightly features to your car. You can buy some great, convenient fold out ramps , which can be discreetly stored when not in use. Ideal for the Labrador who is having a tough time moving up and down, and could do with a helping hand. If your dog has arthritis they will find exercise harder work, but it is important that they stay active. Take shorter walks, with less uphill climbs, and give special attention to how your dog is acting. If he starts to limp more or slows down, then accommodate his pace. There’s no need to put any extra pressure on an already stiff dog, just do as much as he’s comfortable with. One of the best ways for an arthritic dog to exercise is by swimming. This study found that swimming can improve the function of a dog’s arthritic joint. You might even find a local canine hydrotherapy pool that you can take him too for regular dips. Important to note, the same study made it clear that the best way to treat arthritis in dogs is with medicine prescribed by a vet. The swimming pool can come later. Similarly, if you’re unsure about the amount of exercise you should do with your arthritic dog, make sure you consult with your vet or canine physiotherapist. The only way to be sure that your dog has arthritis is to have him examined by a veterinarian. 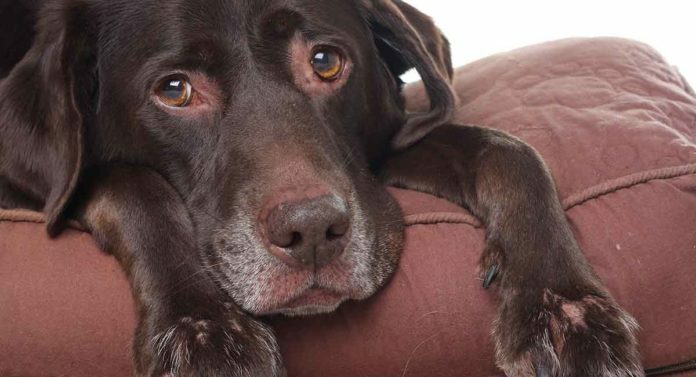 While it’s useful to be aware of the common symptoms of arthritis in dogs, it’s no substitute for a professional diagnosis. Again, don’t be tempted to try to ease your dog’s pain or stiffness with human medication. Stick to medicine prescribed by a vet. It might be worth asking your vet if there are any massage techniques you could learn to use at home. Not that he needs one, but this is a great excuse for your pooch to get some well deserved rubs! Arthritis in dogs can be tough, but it can also be manageable. Have you got a stiff pooch at home? Let us know in the comments below. 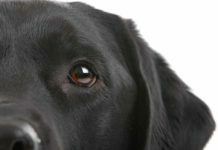 Check out our Labrador Health section for more information on every aspect of looking after your ageing Labrador. The Labrador Handbook covers every stage of your Labradors life, including a focused look on how to best care for your elderly dog. This article has been revised and updated in 2019. My Labrador Sebastian 6 years old has arthritis. He has had bilateral TTAs after rupturing both cruciates and also ripped his meniscus after having both repaired. I give him metacam daily, codeine, rosehip vital, he walks twenty-30mins a day. I also have a memory foam orthopaedic bed for him. We do laser therapy ( only started about 4 weeks ago and I haven’t noticed a difference in his movement). I swim him as much as possible too. We seem to be managing it well, but with winter on the way I worry.. would appreciate any tips on anything natural or other things I can try to keep him comfortable. Thanks 🙂 ? Jonson is my 9yrs old retired search dog, loves ball play. Last week he pulled up while on the field, I really thought the worst with the position he was carrying his leg. After a vet visit and X-rays which showed chronic arthritis in front left elbow. He never had an issue with it before. All my dogs have had yumove working dog for years, he’s currently on 2 a day for his weight,28kgs. Should I increase it? The prescribed tramadol has finished, but he is still on Rimadyl and half a paracetamol twice a day. Has anyone heard of ‘canin gold’? Another supplement which has appeared on the market. I want to do the best for my boy. is the scab like growth normal? Our Lab,Bogie,is in bad shape from arthritis,dysphasia. Vet Ned’s Tramadol,Ramadyl. Great for a few weeks but,now he is nit eating,and bathroom habits not good. What now? Hi Esther, I am sorry to hear that Bogie is feeling unwell. If you haven’t already then the thing to do is to take him back to your veterinarian, and ask for their advice on the best way forward. Best wishes, Lucy. My 4 yr old english diagnosed with OCD in both back ankles – a genetic condition that causes early arthritis (would love to hear some more about OCD from those who have experienced this condition in their dogs). Told he probably had since birth but just becoming noticeable. Specialist wants him to remain active – goes to dog park once a week, runs around in backyard and takes daily walks. We give anti inflammatory (previcox) the night before going to dog park and the night he actually goes, which has helped tremendously in his stiffness and limping the next day. Then he goes on short walk the day after. Also have him on glucosamine. At this point just trying to be proactive in slowing down arthritis while also keeping him a little active. We also have him on a diet, trying to lose a little. 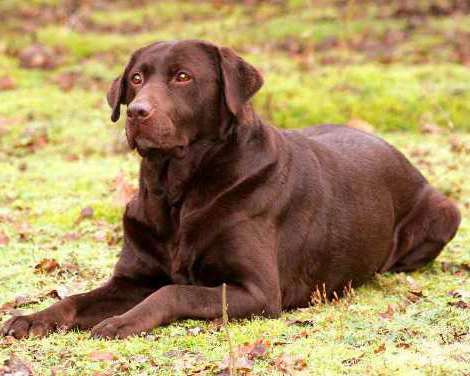 English lab breeders recommend keeping these dogs a certain size which maintains that full bodied english lab look, but by vet standards is usually considered overweight. Our ortho vet has a pool with treadmill which we haven’t used yet, but will consider in the near future as a way to get some good exercise with little stress on joints. So again, if anyone has experienced this condition with their pet I’d love to hear from you on any suggestions for care and exercise in addition to what I am doing. I have a 13 year old labrador who still jumps a 5ft stone wall if he is trying to reach me in the garden. Now I know this isn’t a question regarding a canine arthritis sufferer quite the opposite but I would love to hear if anyone has ever heard of such a gorgeous old boy still being quite so agile at 13? Yes, I have a 13-year old lab mix who is also still very agile, it does happen. We had to take him to the vet because he chewed and swallowed some corn cobs a few months ago… could have been fatal! Anyway, after X-rays they said his spine looked like he was around three years old and he was doing great. Keep loving the old boy like we do at our house and hopefully we will both get a few more good years out of them! Please take your lab to a Vet asap. At 105 lbs. he may be way over-weight, which is terrible for an arthritic dog. A lab needs to be exercised to keep him limber, atleast one walk a day as he may not be exercising himself in the backyard. Try a high quality grain free dog food. He’s young, has a lot of years a head of him, but needs to see a Vet. I have a 12 year old lab, Nougat & he seemed to go downhill very rapidly with arthritis during the last few months. I noticed that he was struggling to get up & was dragging his left hind leg when walking. It breaks my heart to see him like this, but it was recomended that I try him with Yumove. It contains green lipped mussel as well as glucosamine which after a few weeks has made a huge difference to him. I have also invested in a non slip soft flat bed from pets at home. My dog just got diagnosed, she is 12, so she isn’t very young but she is still as up beat and playful (that’s a Lab for you). Any way what I noticed that helps her is a larger bed, she used to sleep on a pillow that was just big enough for her to sleep in the shape of a pretzel ( her favorite sleeping pose, and her choice of pillow), but now we gave her a bigger pillow that allows her to lay down with her back straight, it seems to lessen the stress on her back and joint and reduces the chance of pain when she wakes up. Reading this is giving me extra incentive to keep carrying our 4 month old lab up and down the stairs. Even though she would love nothing more than to race me! Gelatin. Seems to work for our lab, and I have used it several years and feel fabulous! My 12 year old lab has arthritis. I have a magnetic collar for him, a raised food and water bowl, and have just recently put some more mats down on tiled floors as he’s really struggling to get up on them. He’s also on glucosamine supplements and has Metacam daily. Keeping him comfortable is my priority until the day we decide enough is enough. So sad watching them age. My lab, Shelby, just turned five, I recently found out she has a good amount of arthritis in her back legs and upper back. She swims regularly and is pretty active but is a bit over weight. Is there any home remedies I could try to help ease the pain and make her more comfy, I’m not fond of Medicines so she doesn’t become dependent on them. Any advice is greatly appreciated, it hurts to watch her be in such pain. Thank you!! Hi Jenna, many people share your reluctance to use medicines, but pain meds can transform the lives of dogs with arthritis. If your dog is in pain she needs pain relief. And that usually means nsaids. Have a chat with your vet. And good luck with your dog. Be sure her food is high quality and is grain free. Acana & Origen are 2 suggestions. Connectin is a joint supplement you can find on Amazon and pet stores. Remember you are what you eat and this applies to your dog too. My fox red Labrador started limping badly last year at only age 3! After 3 months, decided to have elbow surgery (arthroscopy) on the right front leg. It didn’t really improve until I decided to stop him running completely and just take him swimming in a pond every day and that seems to really have helped. But as soon as we stop swimming, and start to go for longer walks, or if he runs too much, the limping reappears. And he is only 4 years old. He is a pure breed 5th generation Labrador so I am told this can be expected, but will this only get worse in time and can he be expected to live until 12 or 13, or are we looking at a much shorter lifespan because of it? But equally as important in my experience are soft,warm comfortable places to rest both in the home and when travelling,holidays,garden etc. Ice packs post exercise, massage, raising feeding bowls and water bowls. So many things one can do with a little thought to ensure comfort and contentment. My 12 year old lab was diagnosed with arthritis beginning of this year. The vet was not a lot of help just made recommendations re her exercise and no more stairs. After a lot of research I started her on honey and cinnamon !!! She was almost off her back legs and stumbled and fell as well as dragging her feet. It was incredible ………… Within hours she was obviously more comfortable and after a couple of weeks she was back to her happy, pain free self. She is now off the mixture and no relapse as of yet. She is happy and comfortable and walks well, climbs stone walls on the fields etc. yes she slower now but a very happy girl !! You need to be careful with your mix, i did the following : 1 table spoon honey, 1 small teaspoon of cinnamon mixed with 400ml warm water. Pour half mixture over food in morning and half mixture over food in evening. Only side effect was slight loose bowel movement, but this corrected in time. Please watch out for honey with diabetic dogs I’d seek advice first. I had my two oldies treated with Stem Cell Treatment just before Christmas last year. My eldest (now 13) is running around after a number of years with arthritis in his elbow from an earlier injury. My 11 year olds treatment wasn’t quite as successful on his bad front leg but his other legs are much improved. His front leg had a number of loose bits of bone in it that they had to remove. I am hopeful that next time they have the treatment in about October he should see much more improvement. Just an update. My boys have had their stem cells injected again and the results are fantastic. You really wouldn’t know they had arthritis at all. Give our lab collagen, he is six years old and can still run around like a puppy.. My husband and my sister take collagen and have had good results, I take it and have had dramatic results. I hope it will have the same effect on our lab for years to come. Sure Pippa, good suggestion. Our fantastic vets are the Eastgate Veterinary Practice in Pickering north yorks, I’ve googled them the address is eastgateveterinarycentre.co.uk it’s Katie Longmire who is the herbalist. I think the proceedings from the conference where Juno was a case study are in the vet record or the British Assoc of Herbal Vet equivalent so they should be accessible to most vets. My old lass had arthritis in a hip from a serious injury sustained by doing the splits at full tilt on a sheet of a ice (ouch). It didn’t cause too many problems until her later years and the best fix was found by accident. She also had a grass allergy which made her skin dreadfully itchy; we have a herbalist vet who treated her allergic reaction over the summer, it was only come the winter when we stopped her herbal ‘smoothies’ that she became lame again, we hadn’t really realised how much more mobile she’d been over the summer. Katie (vet) tweaked the mix a few times and we ended up with a summer and winter mix. It was so successful she was a case study at a herbal vet conference. Ultimately she needed traditional meds as well but only in a low dose, for those of you used to loxicom (metacam) she was a 30kg dog but on only 10 units a day and we’re sure it was the herbs that kept the anti-inflams at bay. If anyone is interested I have Juno’s ‘scripts, I’m sure Katie wouldn’t mind me sharing the basics, although some of the herbs are only available to registered practitioners. Thanks for that Kerryn, maybe best if you put up a link to your vet’s website if she has one. Then she can advise for the individual dog. i rescued a golden lab 2years and 4 months ago. Two weeks ago i noticed he had difficulty getting up. Then it turned into a limp on his right back side. Took Dakota to vet (costly but love) and she is currently treating him with the RX Previcox for arthritis. If this does not work she wants to do an x-ray. Is it possible for such a young dog to get arthritis? My 8 yr old Lab suffers from arthritis. I started both her and the younger Lab, 6 yrs, on Mussleflex, which can aid joint problems. This can be bought in a health food shop. Since starting the course, the vet has found a big difference and l can now significantly reduce her anti-inflammatory/analegesia medication.